Here's my insight......once again you pulled crap off of the internet, so is that the world in a nutshell? I challenge you....go to a border state and spend some time and let's see what your opinion is about the lawlessness. Bottom line is you don't like President Trump, that is your prerogative. But, when he makes the same comments as former Presidents about the state of immigration in this country you lose your sh!t...now whose the hypocrite? Stumped again I see. typical. Let me know if you can figure out what is keeping the people out of the country, the fence or the agents on the ATV's. It shouldn't be that hard. I'll wait. 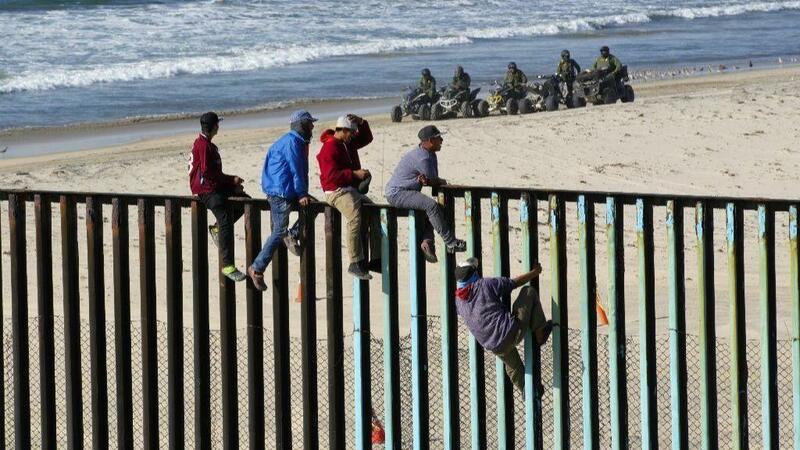 Okay let's play your game.....if I remember correctly the ones on atv's were in the San Diego area....since this is California, a sanctuary state why don't they take the wall down? According to you it's not working anyway.....and furthermore, we could send those resources to another border state to help there. You still haven't learned to read to what I post. I'm embarrassed for you. And in the meantime, let me know if you can figure out what is keeping the people out of the country, the fence or the agents on the ATV's. It shouldn't be that hard. Still waiting. Cher just came and a said we cannot take care of our own people already in California how are we going to take care of all those illegals? LOL, suddenly the left see moving masses of illegals in as a problem. And you have a problem understanding a simple solution......but you want it both ways, which is typical for liberals like you. Since you've been to the border and I haven't, tell me what you see in this picture. What is keeping the people out of the country, the wall or the agents on the 4 wheelers? I'll wait for your insight.